These are sometimes called Little Olive Sedges. To generalize broadly, Cheumatopsyche is found lower in the watershed than the similar genera Hydropsyche and Ceratopsyche. It is also smaller, but there is wide variation in size and color between the species. See the family Hydropsychidae page for life cycle details common to these genera. The most important trout stream species are Cheumatopsyche campyla and Cheumatopsyche pettiti. Cheumatopsyche (Little Sister Sedges) Caddisfly Pupa View 10 PicturesThis is the first fully formed caddis pupa (technically, a pharate adult (Pharate adult: Caddisflies are considered to be pupae during their transformation from larva into adult. This transformation is complete before they're ready to emerge. The emerging insect we imitate with the "pupa" patterns we tie is technically called a pharate adult. It is a fully-formed adult caddisfly with one extra layer of exoskeleton surrounding it and restricting its wings.)) that I've collected and photographed alive and healthy. I'll put a video of this specimen online soon, too. 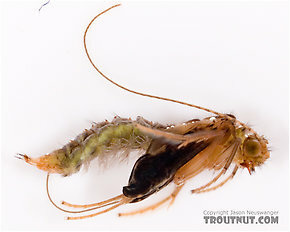 Pharate adult: Caddisflies are considered to be pupae during their transformation from larva into adult. This transformation is complete before they're ready to emerge. The emerging insect we imitate with the "pupa" patterns we tie is technically called a pharate adult. 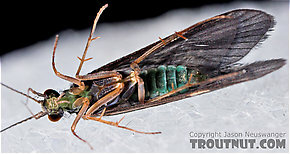 It is a fully-formed adult caddisfly with one extra layer of exoskeleton surrounding it and restricting its wings.